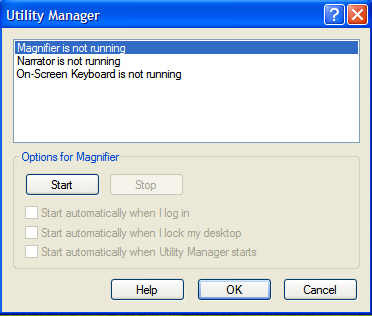 You can start the Utility Manager by pressing the Windows key + the u key at the Welcome Screen. What is the Utility Manager, it starts or stops the accessibility programs. The Magnifier which you can use to magnify text that you are trying to read. The narrator, which will read the text on a page for you and help you to start some programs in Windows XP, such as the Utility Manager. The On-screen Keyboard, if you have difficulty with a regular keyboard you can use the On-screen keyboard and use your mouse to click on the keys or a joystick to hover over the key for a predefined period of time to type text. It is located by going to Start-All Programs-Accessories- Accessibility-Utility Manager, when you start it, there is a check box you can check, to have it startup when XP boots up.